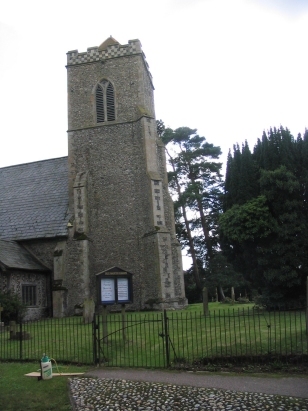 Shelfanger parish lies in southern Norfolk in the lanes to the north-west of the market town of Diss. A linear village along a north-south main road the properties straggle over a long distance with the village centre grouped around the church. All Saints church dates largely unaltered from the early 14th century. The slightly off-set tower seems to indicate that a north aisle has been removed at some time in the past. The pretty chequer pattern to the top of the tower is an attractive feature. This transcript was prepared from microfilm MF 1633 in the collection of the Norfolk Record Office. The filming is relatively recent and is clear reflecting the improvements in filming technique in recent times. 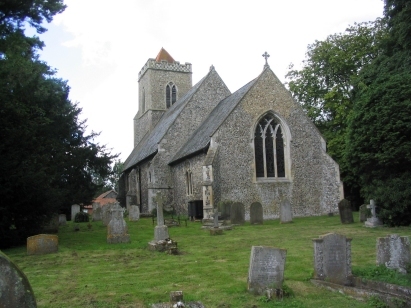 One notable feature of this parish is the rather high frequency of "late" baptisms - not only the family batch baptisms, but also of youngsters and even teenagers of many families being baptised on the same day. Researchers should be certain to check periods later than they expect to find their baptism. The standard of handwriting in the records was the only qualifier to what it is hoped is a relatively accurate transcript.